MINNEAPOLIS ― When Natasha Cronen got married last September, she knew exactly what her bridal bouquet would look like, down to the petal. That’s because she’d made it herself, two days earlier, along with all the other flowers for her wedding. Cronen, of Woodbury, Minn., and her bridesmaids gathered at Market Flowers near the Minneapolis Farmers Market to craft coral and white roses into bouquets, centerpieces, corsages for the bride and groom’s mothers and grandmothers as well as boutonnieres for the fathers and grandfather. She loved the way her flowers turned out. “I got a ton of compliments on them.” And she also saved a lot of money, spending about $500 total on wedding flowers vs. the $2,000 she would have paid to have a florist create similar pieces, she estimated. The explosion of online tools and scrapbook boards, along with the trend toward casual outdoor weddings with simple floral arrangements, have fueled a wave of DIYers trying their hand at wedding flowers. With how-to instructions just a Google search away, and inspirational photos abloom on Pinterest, amateurs now have the resources they need to nurture their inner florist. “It’s really grown,” said Diane Barriball, owner of Market Flowers (www.marketflowersmpls.com), which started offering use of its facilities to DIYers several years ago. They can pre-order the flowers they want or choose from what’s available, make their creations at one of six design stations, then store them in the cooler for a day or two before the big event. The first year it offered the service, Market Flowers hosted one or two DIY groups, Barriball said. Last year, they were booked every weekend from May through October ― not just for weddings but also graduations, class parties, dance recitals and other occasions. And not just for women. “We’ve had guys ― a few grooms, brothers and dads,” she noted. Even some professional florists are starting to cater to the DIY crowd. 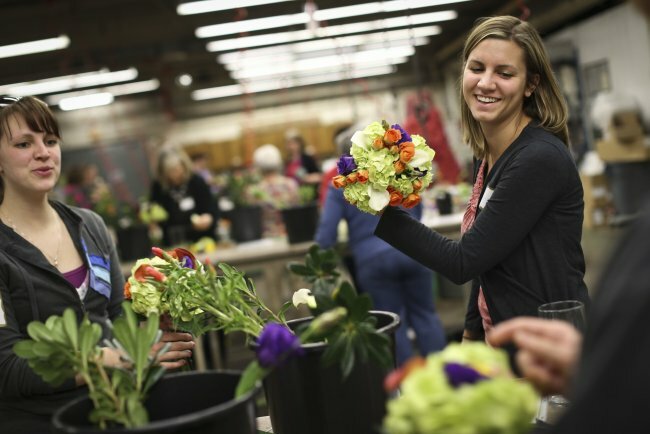 Bachman’s (www.bachmans.com) offered its first DIY bridal floral class last fall, which sold out, said Leah Schmidt, wedding and events manager. “It was a big hit. There was huge demand for another one.” So Bachman’s offered another class last month, and it, too, sold out. “DIY brides are full steam ahead,” she said. At the most recent class, about two dozen women of all ages gathered in the cool, flower-fragrant basement of Bachman’s flagship store in Minneapolis to learn how to make a bridesmaid’s bouquet, using calla lilies, hydrangea, lisianthus and spray roses, plus two different styles of boutonnieres.